Peppercorn is a versatile ingredient that can be used to give your salad dressing that extra something. 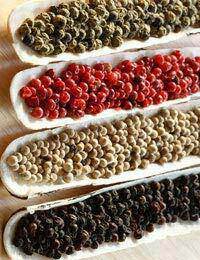 Peppercorn is the fruit of black pepper, with pepper being produced from the grinding of the peppercorn fruit. To make a lower fat peppercorn salad dressing is relatively easy and just as delicious as the full fat version. First take the egg yolks and a bowl and, using a fork, mash well before adding the mayonnaise and mixing well with the eggs. Once the mayonnaise has been mixed well you can then add your buttermilk. Once everything is blended together you can then add a dash of Worcester sauce and your peppercorns. If you so desire, you can also add other ingredients to your peppercorn salad dressing, such as honey or granulated garlic. Take all the ingredients and mix well in a bowl, adding more milk if mixture is too thick, before placing in the fridge for approximately 45 minutes. First, using a small frying pan, toast the hazel nuts in olive oil before adding the juice from the mandarin and lime. Once these have been brought to the boil, and the pan removed from the heat, add some salt and pepper and set aside to cool off. Your dressing is now ready. For the salad, first slice your salmon into small sections and add equal amounts to each plate. Next take the dill, apple, fennel and parsley and place in a salad bowl before mixing in the salad dressing. Once you have ensured that the salad is well coated add to the plates, where you have already placed the salmon fillets, and top with peppercorns.